In my teens, I dressed to be part of whatever was "cool". In my late teens, I dressed to impress the boys. In my early twenties, I dressed to get a job. Boy do I have a fair share of cringe-worthy fashion moments. Constantly dressing with others in mind does that - coupled with the fact that style wisdom only really forms over time. It's only recently (in my mid to late twenties) I left all that behind and started wearing what I felt was me. All those phases and countless regrettable outfit choices are inevitable and I think, necessary evils in the path to self-discovery. I know who I am and what kind of fashion language I'm trying to communicate now. I've stopped dressing to be "in with it", I've stopped dressing for the boys, and I've stopped dressing too "safe". You can say that my fashion "sense of humor" has slowly evolved - I no longer take things too seriously. I wear what I like, what's comfortable, and what makes me feel good. When it comes to trends, I tread cautiously. I will give anything a try, but will never force the issue. If I feel awkward in something or if it calls out too much attention in a way that I'm uncomfortable, I'll pass. I never thought I'd be able to rock camo pants. But on a random trip to Old Navy, there they were. Why not? 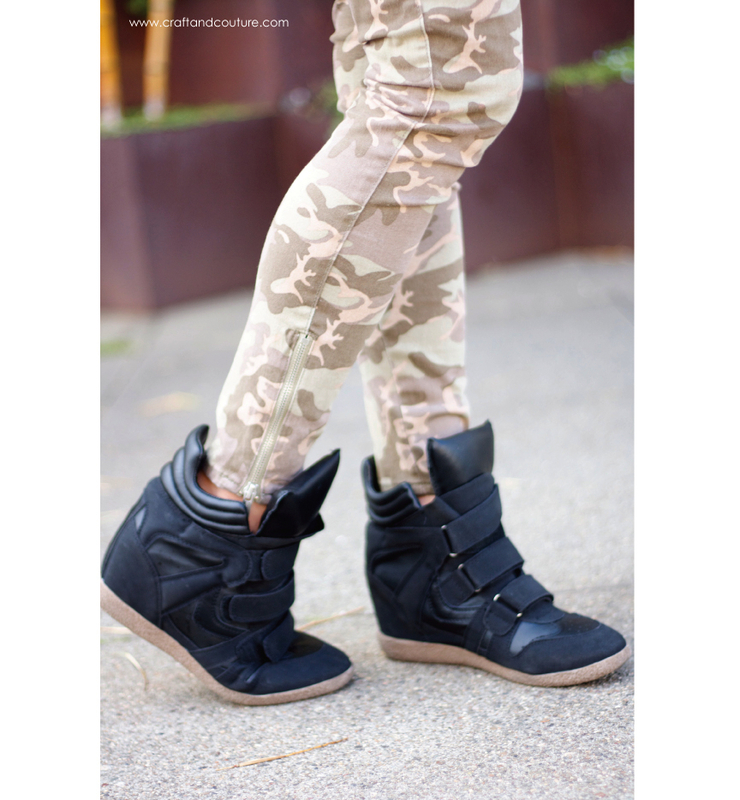 Oh hello, cute badass little camo skinnies! You make me feel strong, confident, fun - I think I'll keep you. And on another trip to Target - spotted in the shoe aisle were these Marant-inspired kicks. Um, sneakers that cushion every inch of my foot and make my legs look a tad bit longer? Yes, please. So I've embraced these two trends. Paired with something simple like this cable knit sweater- and I still feel so very me. A tough-chic version of me. And if ten years from now I look back at these pictures and laugh at myself - at least I know there won't be regret. Just the happy memory of how good I felt taking a chance on a pair of camo pants.